The response and feedback on the Housing Trilemma has been amazing this past week, if not a bit overwhelming at times. A big thank you to those of you sharing, asking questions and providing feedback and thoughts on improvement. I really appreciate it. Unfortunately in my effort to keep the original post a manageable length, I left out a few additional details that would have helped the public conversation this past week. I want to clarify three things regarding the placement of metros on the Venn diagram, the Midwest/Great Plains, and also the quality of life measures. First, while only 15 metros were listed on the Venn diagram, every single metro does fit on it somewhere. I only used a few representative examples for each part of the diagram. This has been a point of confusion, due to my failings of explaining that originally. For example, while I mention that 8 individual metros rank among the top half along all three dimensions, I only show 3 metros in the middle part of the diagram. Additionally, New York slots right in between San Francisco and Portland and Kansas City is just to the right of Oklahoma City in the original work. From a broad regional perspective, here is how the Venn diagram looks. As you can see, these regions and the select metros listed originally line up accordingly. 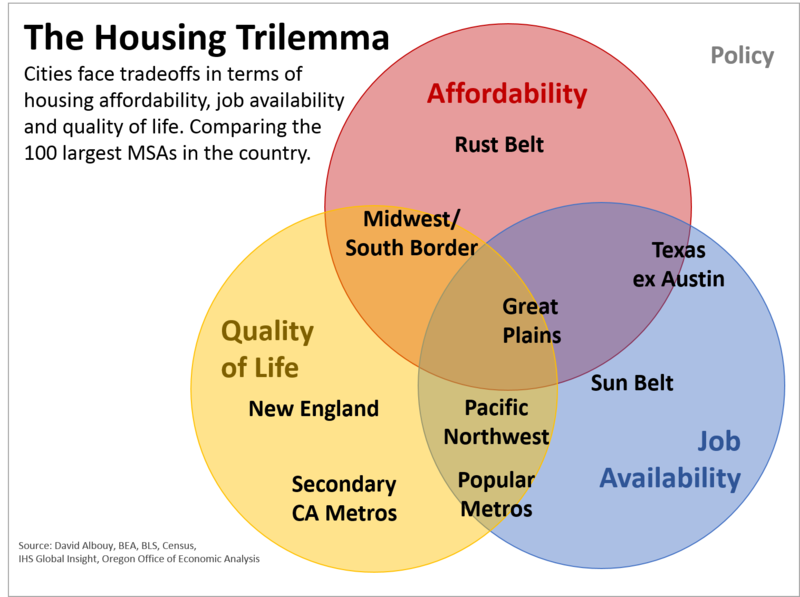 Second, the Midwest or Great Plains do not generally knock any particular dimension of the trilemma out of the park. Rather, they score very solidly along each dimension. That is why they are placed in the middle, or overlapping region. This does not necessarily mean they are the best place to live in the country — that is up to you! — just that the underlying data indicates their placement is probably higher, possibly significantly so, than the conventional wisdom suggest. Third, there are two quality of life variables used. One comes directly from the academic literature. Professor David Albouy has conducted some great and fascinating research on metropolitan areas, including both quality of life measures and housing cost differentials (both used in the trilemma work). It is a composite measure that looks at the characteristics of a place for which people are willing to pay more to live in, after controlling for incomes, essentially. The underlying variables include things like weather, distance to the ocean, crime, air quality, bars and restaurants, and arts and culture. The second variable used is household purchasing power, effectively getting at how far one’s dollar goes in a particular place after adjusting for the cost of living. Combined these measures get at nice places to live where you can afford to do so. They are not perfect measures, of course, but do provide fairly reasonable rankings across all 100 metros. The Great Plains/Midwest metros tend to rank in the 30-50 range. Maybe a triangular diagram would work better, with each side providing a relative axis from most to least. Placement anywhere within the triangle reflects the fact that all three characteristics are present to varying degrees. Thanks Bill. I can certainly see that working. I’ll give it a try! One complicating issue you run into more with the triangle, but you also do with a Venn diagram, is ending up at the same point on the chart but for different reasons. If you rank terribly in all 3 dimensions, or if you rank very well, the dots are at the same location. It can be challenging.